The primary requirement for casters is being able to take rough handling without suffering structural failures. One method of caster testing is hitting the caster frame with a measured force and checking for signs of structural damage. This test is normally performed by an operator who operates an impact tester and then visually (manually) inspects the caster for damage. This approach is expensive to perform and slows production. Manual inspection leaves open the possibility of operator error and can also miss subtle failures that are beyond the capability of the human eye. One caster manufacturer identified a market need for a more robust product that offers 100 percent visual inspection. This created the challenge of developing an automated approach to impact testing and the subsequent inspection. 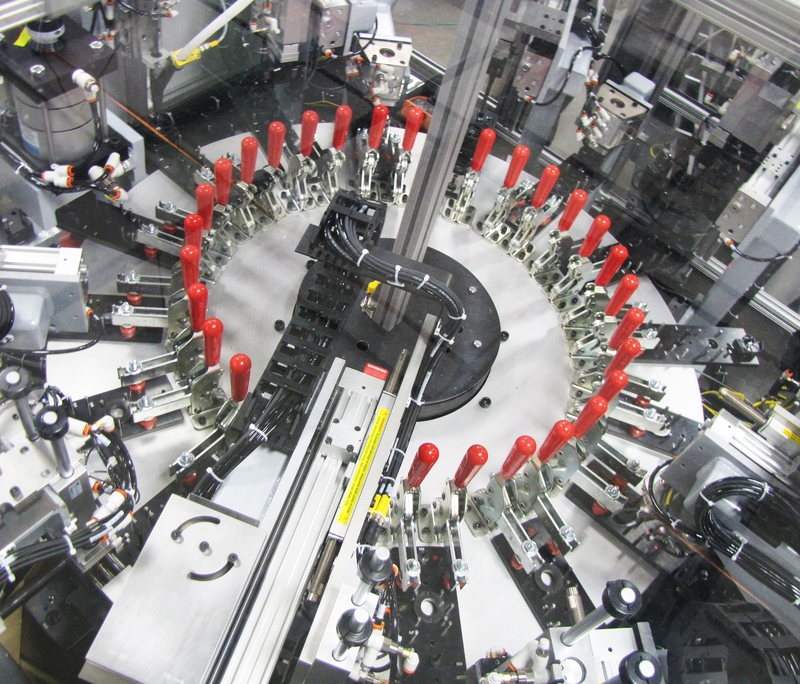 Invotec’s manufacturing system includes a 16-station indexing dial machine that takes the components through every assembly operation plus testing and inspection (Figure 1). Four different components are manually loaded into feeder bowls at four different locations. The inspection operation is performed first on the main frame so that molding problems can be identified before further value is added to the parts. The frame is fed into the side of the inspection station and loaded into a fixture in the station. A pneumatic drive lifts a weight riding on a rail above the part. The drive then releases the weight, dropping it onto the frame. The weight is designed to deliver a specified amount of energy to the part. The frame passes the test if it doesn’t sustain any visible damage. The key challenge here was to reliably and quickly identify parts with any of the specified defects. The Cognex In-Sight 5100 vision system fits that bill and comes in at a reasonable cost. Invotec engineers performed a series of high-force tests to create samples of failed parts (Figure 2). They backlit the part on the fixture so that a flaw showed up as a light area in the dark part. A spreadsheet was used to configure the vision tools and handle the data created from the vision application. 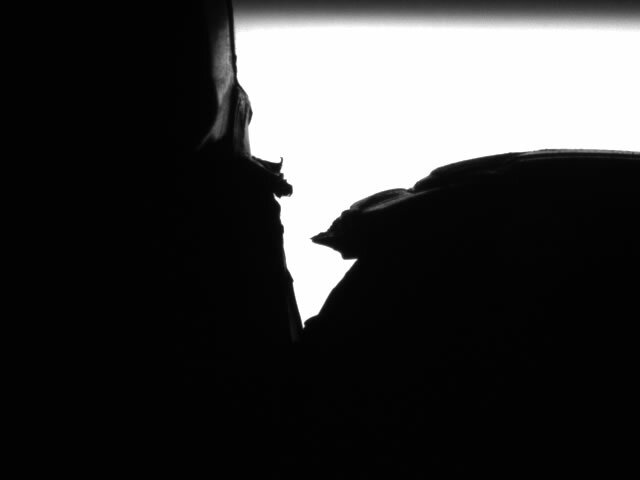 A histogram tool helped to identify areas on the part where the light was passing through. After inspecting the part, the vision system sends a pass/fail signal to the PLC controlling the dial machine. If the part is bad, it cycles through the remaining stations without any further operations being performed to avoid wasting additional components. If the part is good, a small heated spherical tip applies a thermal mark that provides assurance that the part has passed impact testing (Figure 3). A second camera is used to ensure the presence of this mark. This camera uses a pattern-matching algorithm to “see” the mark. The algorithm learns an object’s geometry using a set of boundary curves that aren’t tied to a pixel grid, and then looks for similar shapes in the image without relying on specific gray levels. Figure 3. 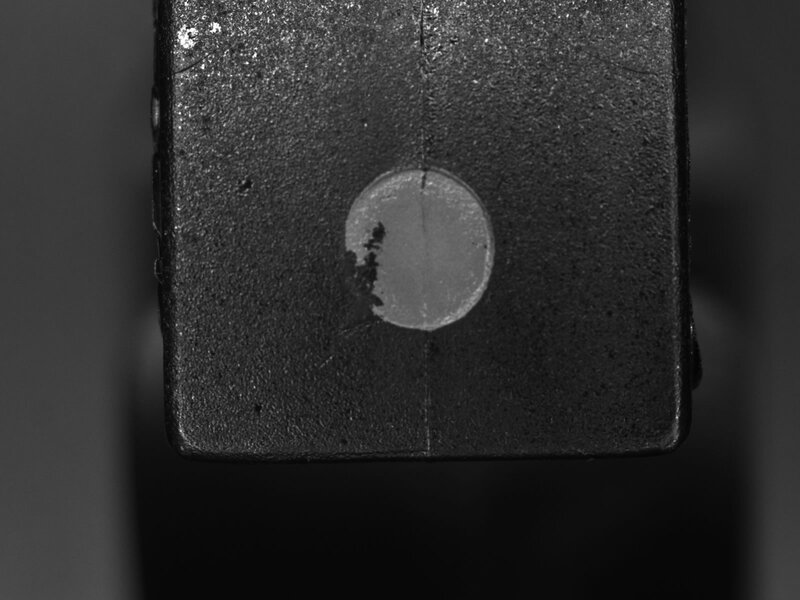 An incomplete good part marking – a passed part that the stamp station failed to completely mark. The machine performs various automated assembly operations using technology that’s similar to previous caster assembly systems. The caster components are inspected and assembled using pick-and-place technology. Once assembled, the casters are radially riveted together and receive a measured grease application. The completed caster is then loaded in a good parts bin for shipment preparation. The new process brought the entire assembly, testing, and inspection process down to a five-second cycle time and two different sized casters can be produced with a short changeover. Rick Roszkowski, a senior director of Cognex Corp.’s Vision Products Business Unit, has been a technical professional in the machine vision industry for more than 25 years, holding positions ranging from software development, application engineering, engineering management, and product marketing.